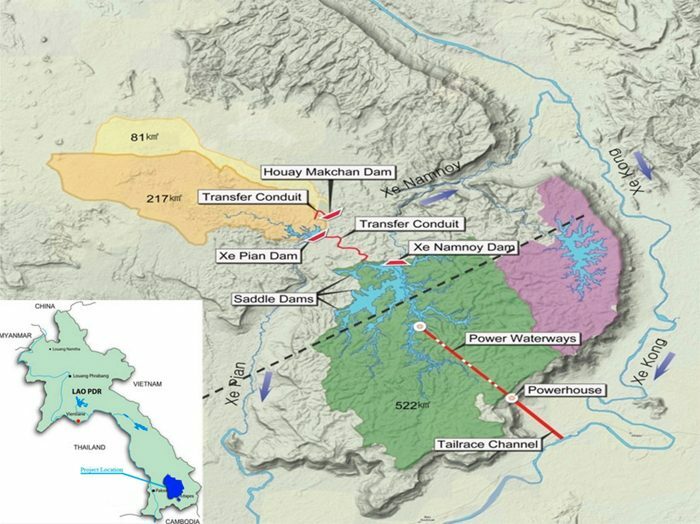 The development of hydropower in Lao PDR has been very contentious. In this area a dam started to be built in February 2013 and was expected to be completed in 2019. One of the subsidiary dams failed on 23 July 2018 causing a major disaster. The development of hydropower in LAO PDR has been very contentious. . Then, the US$1.2 billion Xe-Pian Xe-Namnoy project located on the Xe Kong River in Laos' Bolaven plateau, collapsed. The dam construction began in February 2013 and was expected to be completed in 2019. It is part of the dam construction boom in the country with the aim of generating electricity to be exported to Thailand and become the "the battery of Southeast Asia" . The Mekong and its tributaries would the source of hydropower, which (in money terms) was 23 % of exports in 2017, from 47 hydroprojects that should reach 100 by the year 2020. 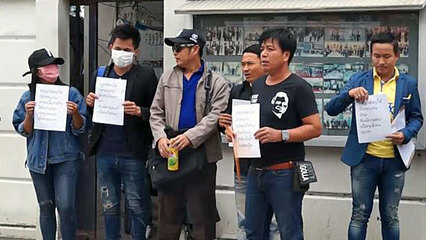 The failed dam planned to export 90 percent of its electricity to Thailand and the remaining amount was to be offered up on the local grid. On 23rd July 2018 it was reported that there were at least 27 people have been killed and more than 100 are missing in flooding of at least six villages following the collapse of one of the subsidiary dams, known as "Saddle Dam D". More than 6,600 people have been made homeless. As of 30 July, there are at least 27 dead, over 100 people missing and 16,000 affected. The collapse of the dam Monday was not the first in Laos. Last year, a dam on the Nam Ao River that was being built as part of a hydropower project burst, although no deaths were reported after that accident . Some residents whose villages were in the way of the hydropower project have resisted moving, saying the compensation they were offered was too small and the land they were offered was unsuitable for farming. “In addition, families have found that the shallow soil around their homes is inappropriate for growing vegetables, fruits or staple crops, and consistently attest to going hungry,” the letter said . The EJAtlashas recorded the details of building and opposition to several dams in Lao PDR. There has been criticism for many years against the building of many dams in the Mekong River. There was a typical reaction to the collapse of 23 July 2018 from one of the dam building firms, the Mega First company which is building the 250 MW Don Sahong dam, also in Southern Laos near the Cambodian border. Their press release aserted that "Having reviewed the circumstances surrounding the incident, and the specific and unique characteristics of the Don Sahong Project, the board is satisfied that present and future dam safety risks remain extremely low". Really? The government's figures on deaths are still increasing a few days later. . A high-ranking Lao official suggested that the dam collapse in Champassak province was the result of faulty construction and said the project’s developer should be held accountable, as the death toll from flooding has reached 30, with more than 20 hospitalized for injuries. Project Details Xe-Pian Xe-Namnoy Power Company's (PNPC) 410MW Xe Pian Xe Namnoy hydroelectric power project is estimated to have an annual energy generation of approximately 1,860GWh. The project includes the construction of three dams: Houay Makchan Dam, Xe Pian Dam, and Xe-Namnoy Dam along the Mekong River. It will consist of a large storage reservoir on the Xe Namnoy River, underground tunnels, shaft waterways, and an open-air powerhouse featuring four generator units (three Francis turbines and one Pelton turbine). The Xe Namnoy reservoir will be 73m-high and 1,600m-long, and will have a capacity to store approximately 1,043 million cubic meters (MCM) of water. Approximately 1,000MCM of water will be collected from Houay Makchan and Xe Pian catchments and stored at the Xe Namnoy reservoir. ATT Consultants Company Limited (ATT) from Thailand - ATT Consultants were engaged for designing the transmission system model, which will enable the transfer of power to Thailand. AF Consult from Sweden - AF Consult was engaged to conduct pre-feasibility and feasibility studies, engineering for basic design and tender documents, environmental and social management aspects, and to provide support services for finalising the concession and power purchase agreements. Tractebel Engineering from Belgium - Tractebel Engineering was engaged as owner's engineer for the hydropower plant construction. Why? Explain briefly. Some weeks after the breakdown, it is not yet clear how many people lost their lives immediately, how many "disappeared", how many survived but lost their homes and livelihood. The costs of the failed project and the potential benefits (in terms of electricty exports) are grossly asymetrical. Kenneth Olson, “Water rights and fights: Lao dams on the Mekong River,” Journal of Soil and Water Conservation. March 2018. Lao Dam Collapse Caused by Heavy Rains, Faulty Construction: Minister. 2018-07-26 On the night of July 23, water poured over a saddle dam at the Xe Pian Xe Namnoy hydropower project in Champassak, sweeping away homes and causing severe flooding in up to 12 villages downstream in Champassak and neighboring Attapeu province.